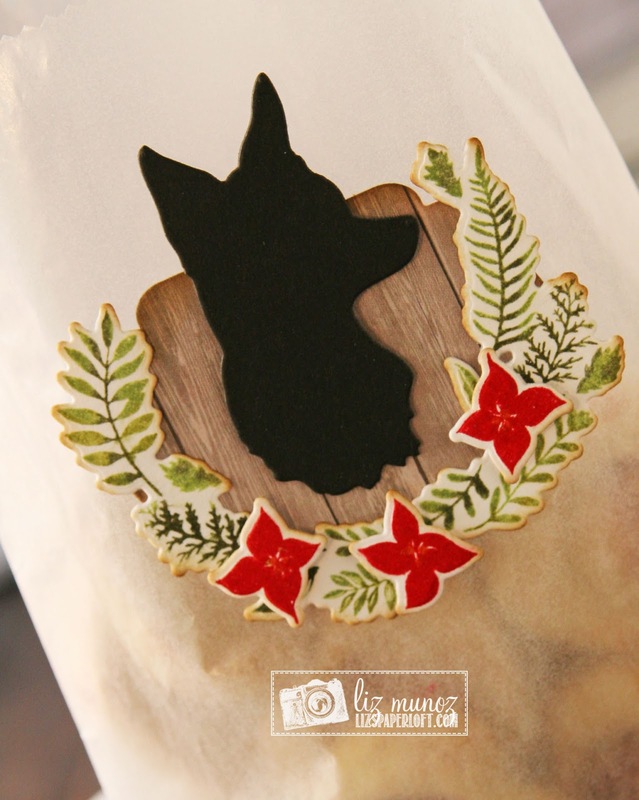 Liz's Paper Loft: MCT September Release Sneak Peek Day 4 ~ little doggie! MCT September Release Sneak Peek Day 4 ~ little doggie! perfect for a treat bag. Yes, I do have doggie treats in it, lol! To stamp and cut the wreath, I first cut out the wreath with scrap paper. Then I place the negative of the scrap over the paper I wanted to use. Next I laid the stamp in the negative space, then used my stamping block to "grab" the stamp. By doing this I was guaranteed that the stamped image would fit properly when I die cut it. I always stamp first then die cut, I'm rarely accurate with my stamping if I die cut first then stamp. I used several color green markers directly on my stamp to create depth in the foliage. Oh Miss Liz...What a Super Cutie of a Treat idea....and your doggie looks so cute and love how you showcase him with your pretty wreath. YOU SO ROCK!! Such a neat treat bag, love it! This is just darling, Liz! You are going to make some doggie very happy! Your card is georgeous!!! 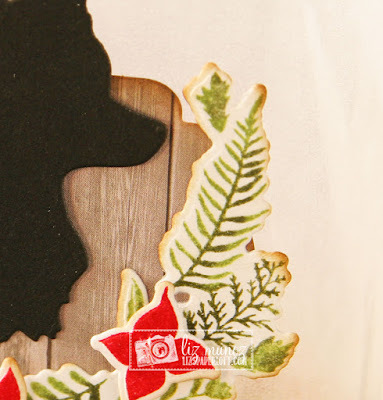 you would love a misti for stamping....they are wonderful...if you want to see how they work go to My sweet petunia....I loved my first one so much I went back and got the big scrapbooking one!!! support dog at the end of the month. 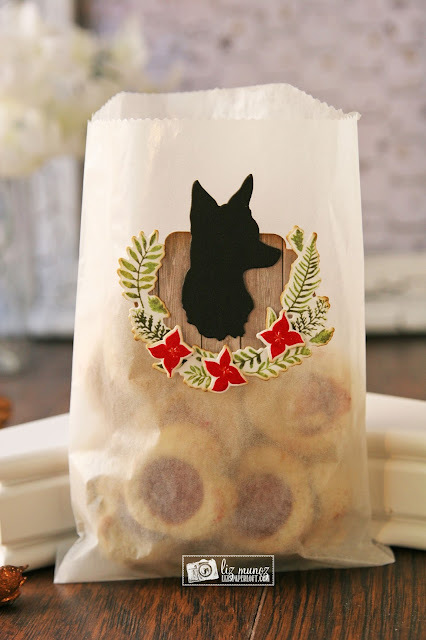 Sweet doggie treat bag! I like the depth on your foliage! Great job. Ms. Liz, what a great treat bag! Beautiful embellishment of your pretty treat bag! Perfect way to decorate a doggie treat bag. What a cute gift for the doggie. Love your idea. Love the little doggie bag! What a great idea! Almost all of my family has dogs. This would be great to make something like this for them. (The dogs that is!) LOL!